We love doing our own home improvements, and recently I saw this faucet and knew I had to have it! When Pfister asked us to review a faucet, I knew this one was for me! So, I replaced my old bathroom sink faucet and drain with a new Price Pfister 49 Series Lavatory Widespread Faucet from their Ashfield Collection. I’m not the handiest person in the world, but the process, though somewhat time consuming, is really fairly straightforward and understandable. The amount of time needed could be anywhere from one to several hours, depending upon your level of comfort and skill. I’d describe myself as mostly clueless, but willing to try anything, so I spent a big chunk of my day on this project, but then, I caused myself an extra step. More on that later. Needless to say, the instructions were my friend. The instructions included with this product were very well written, with clear and understandable illustration and clearly labeled parts. They were a step above many instructions I have worked with in the past. The first step in any instructions sent with these products always seems to be to read all of the instructions first. That’s actually a really good idea. It helps ensure you have everything you need so that you don’t have to stop the project in the middle. It will also help with step 4. Clean out the area under the sink. You will need the room to work. Shut off the water supply. Hopefully you have local shut off valves on the water supplies located under the sink. If not you may have to shut off the main water supply valve to the house. If that is the case, make sure that your family won’t need to use water for a few hours. Remove the old faucet and drain. This can be the hardest part, because you have no instructions for it. I used the installation instructions as a guide, working in reverse, as a guide. There were a lot of similarities, so this worked quite well. Remove the drain first, as it will increase your working space. There is a lot of variation in how these are assembled, especially around the ball rod connection, so you may have to play around with it. Then remove the faucet. 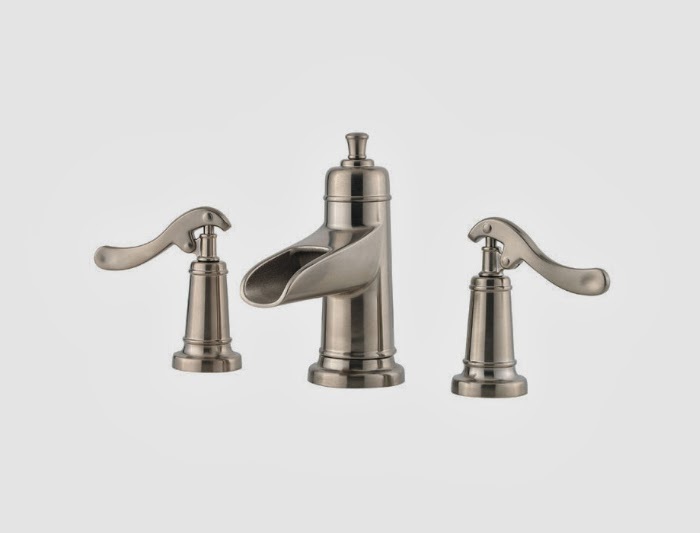 The Price Pfister faucet has a quick connect system for the water supply lines, which your old faucet probably won’t. You’ll probably just have to unscrew the old water supply lines. Be careful not to damage them. If your old sink has been in place for a long time, you may have a hard time unscrewing/disconnecting things. This is where you use the penetrating oil. Clean up the sink. The drain hole can be quite disgusting after years of service. Install the new faucet valves. Start by installing the valve bodies. Use the handles to ensure that they are closed and properly aligned, with the hot valve on the left. Tighten them down once aligned. Then mount the handles. The printed directions cover this step quite well. Install the spout. Insert the lift rod in the spout body and place the plastic mounting ring against the bottom of the spout body. Feed the lift rod and mounting shank through the hole in the sink, then secure with the metal washer and mounting nut. Make sure that the spout is properly aligned before you tighten it down. The printed directions cover this step quite well. Install hose connection and water supply lines. The connection system for this faucet made attaching the water supply lines much easier than on other water connections I have worked on. Make sure the hot water supply goes to the left. The printed directions cover this step quite well. Install the new drain body. The locknut which tightens the rubber washer to the underside of the sink must be tightened down very securely. If you ever have to plunge out your sink, there may be a lot of water pressure against this washer, and you want to be certain it doesn’t leak. The locknut looks like it is meant to be tightened by hand, but you should use a channel lock pliers. It is quite narrow, so your hand will end up partially resting on the drain threads. You have to use a lot of pressure to turn the locknut, and this does not go well with sharp pipe threads pressed against your skin. I ended up with four perfectly parallel bleeding cuts up the length of my finger and a bit of my thumb. USE A PLIERS! Attach the lift rod to the ball rod. You will need to adjust the height of the connection strap until you are smoothly able to move the drain from fully open to fully closed, with no hangups. Turn your water supply back on and check for proper operation and leaks! Purchase a 1 ¼ inch hole-saw and arbor. Using a ruler and marker, I marked out the center points for 2 new holes at 8 inches of separation. I then used a 1/16 inch drill bit and my cordless drill to drill a pilot hole on each side. I then mounted my new hole-saw and arbor to my cordless drill and used the pilot holes to drill out new holes. This also left me with 2 plugs. I cut up an old wooden paint stirrer I had into 3 inch lengths, then super-glued the plugs to the center of each length of wood. I then super-glued the wood and plugs to the underside of the sink, plugging up the old sink holes. Finally, I used a putty knife to spread white, mildew-free sealant into the crack around and the hole in the center of each plug, working it in until the surface was a flush as possible. During this process I supported the plugs from underneath with my hand, so that I didn’t dislodge them. 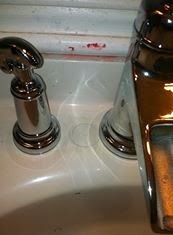 The color was a perfect match from the sealant to the plug and sink surface. If you are looking closely, you can see that this isn’t the original sink surface, but only if you are paying attention. This process added at least an hour to the overall project. Under the votive, the hole has been filled in, and up close you can see a ring where the hole once was. Your experience may vary in terms of how light or dark this is. We tried to get as close of a match as we could. We love the look of the new faucet. It is very elegant and impressive. 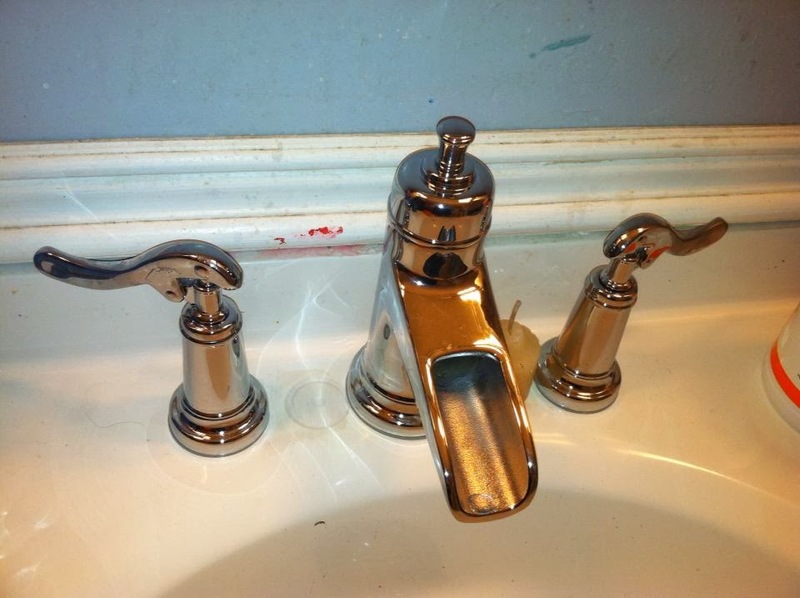 We're glad you love your faucet and found the installation process to be relatively easy to complete. Thanks so much for sharing your experience and step by step instructions. Hopefully your readers and ours will find them helpful!